It all started on KickStarter. 68,929 backers. $10,266,845 pledged of an original goal of $100,000. That’s 10,267 percent of the original funding goal. OVER 10,000 PERCENT! Earlier this year, the Pebble E-Paper Watch became the most highly funded KickStarter project ever with over 85,000 units pre-sold, and it is certainly causing quite a ruckus. I can definitely understand why. First off, what is it? It’s a “watch” only in so far as it tells time and is worn on the wrist. But, it is also a speedometer, music controller, pedometer, golf rangefinder, caller ID, email reader, Tweeter, Facebook-er, SMS reader, alarm, meteorologist and Bell & Ross-watch-dial-mimicker. Let me back up. 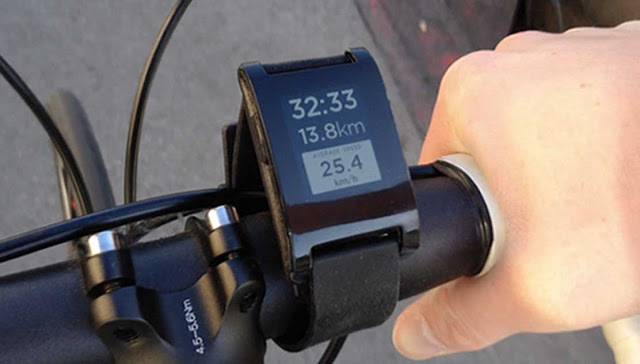 The Pebble is a “21st Century watch” with internet connected apps that connects via Bluetooth and operates through your iPhone or Android phone. The Pebble has an ePaper dial, which means the dial can be infinitely reconfigurable to any design, as long as it is black and white. It’s the same technology you’ll find on most e-readers. With a variety of downloadable watchfaces, your Pebble can be a binary clock, a Bell & Ross look-alike or any other number of choices. 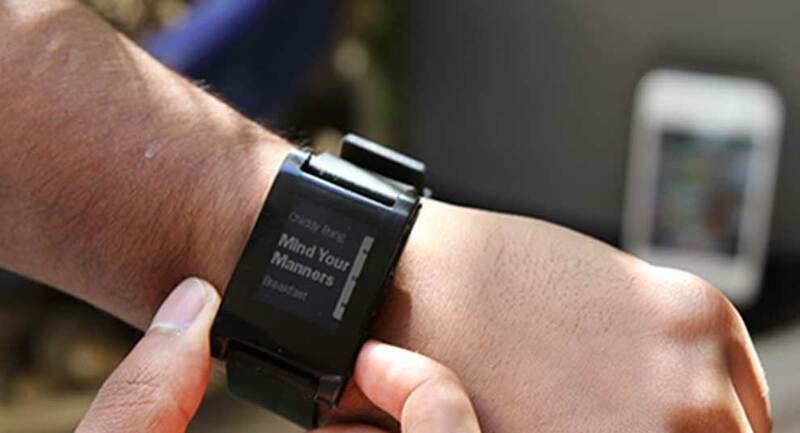 App wise, Pebble is constantly developing new apps for the watch. As of right now, you can read your email (as long as it’s IMAP), control your iTunes and Android music, read texts, get GPS directions from your phone and gauge your distance to the tee with an app co-developed with Freecaddie that works on 25,000 golf courses around the world. 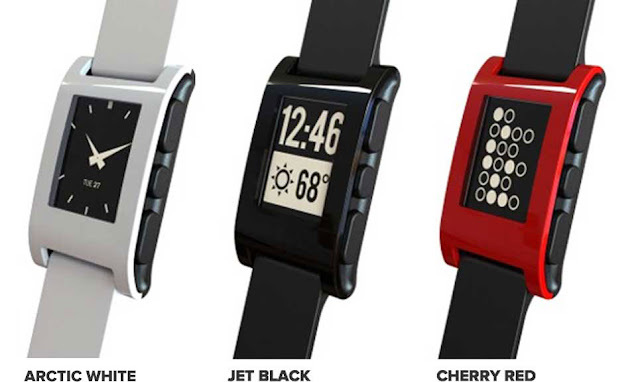 Price of the Pebble E-Paper Watch is $150 and you have your choice of Arctic White, Jet Black, Cherry Red, Orange and Gray. Sorry if this review reads a bit like an ad for Pebble. I actually am very impressed with the watch and can’t wait to get one. Pebble has a pretty good FAQ for their watch. Check it out below. If you still want more info, visit GetPebble.com. Pebble connects by Bluetooth to your iPhone or Android device. Setting up Pebble is as easy as downloading the Pebble app onto your phone. 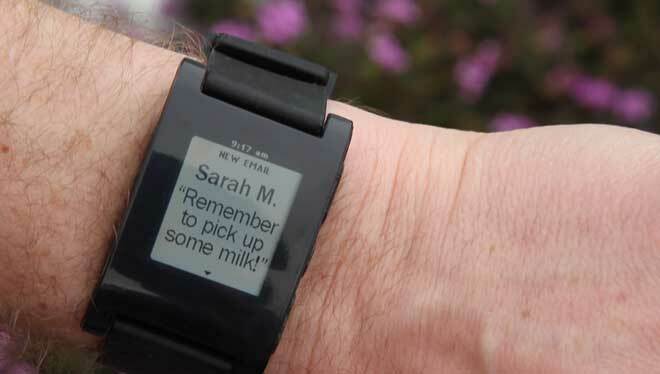 All software updates are wirelessly transmitted to your Pebble. iPhone 3GS, 4, 4S, 5 or any iPod Touch with iOS 5 or iOS 6. Android devices running OS 2.3 and up. Works great with Android 4.0 (Ice Cream Sandwich)! Unfortunately Pebble does not work with Blackberry, Windows Phone 7, or Palm phones at this time. A. 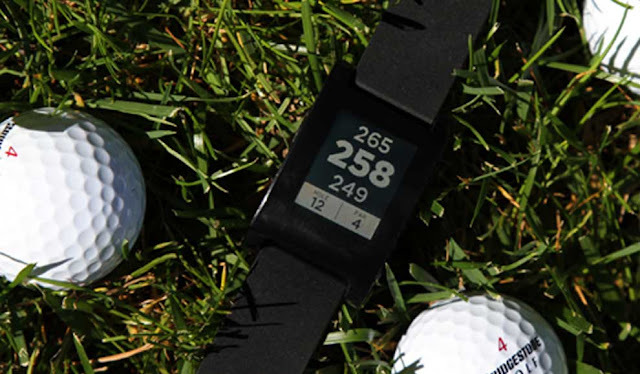 The rechargeable battery keeps Pebble going for 7+ days. Q. Does the watch display stay on all the time? A. Yes. The display shows a watchface at all times. Q. Does it have a backlight? A. Yes, Pebble has a backlight to view the display at night. A. Pebble is rated at 5 ATM, tested for both fresh and saltwater. You can swim with your Pebble and change tracks while in the shower. A. Pebble has a scratch and shatter resistant lens with an anti-glare optical coating. Q. Does it use up my phones battery? A. Pebble is a Bluetooth device, similar to a Bluetooth headset. It does affect the battery life of your phone, usually using up an extra 5-10% per day. Q. How does it charge? A. We include a special USB cable. You can charge Pebble using your computer or any wall USB charger. Q. Can I replace the bands? A. 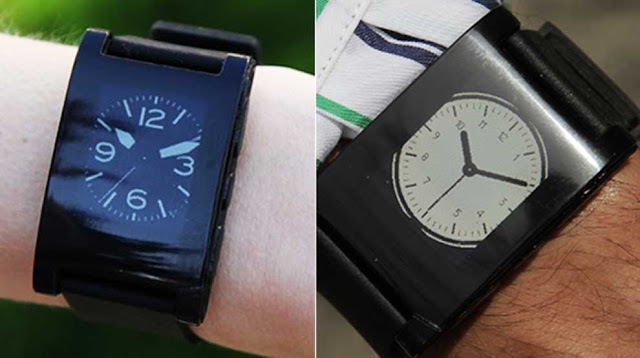 Yes, Pebble is designed to fit most 22mm watch bands. Christophe Claret Margot: She Loves It? She Loves It Not?